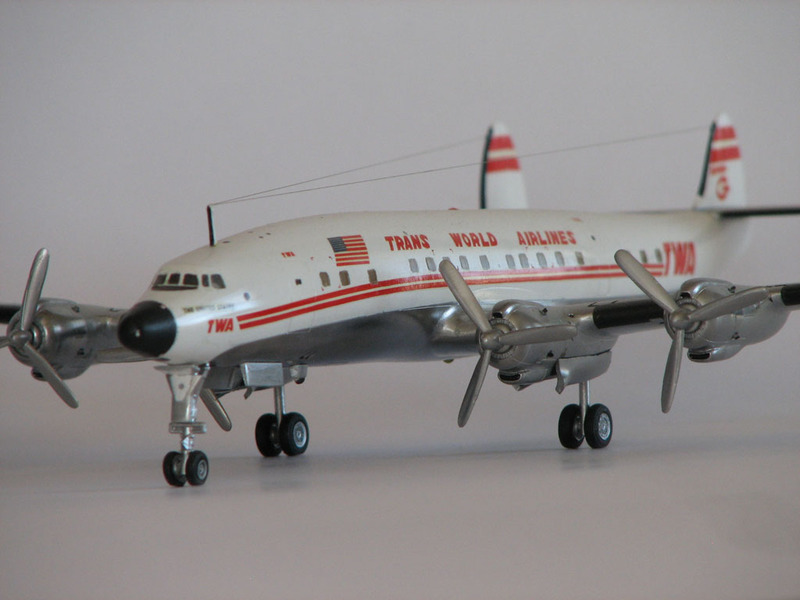 An award-winning airliner model, done "out-of-the-box"
The Monogram kit used here was an original kit from 1959. While the shape and dimensions are accurate, as is typical for kits of that era, the scale is a real odd ball. It works out to about 1/128. 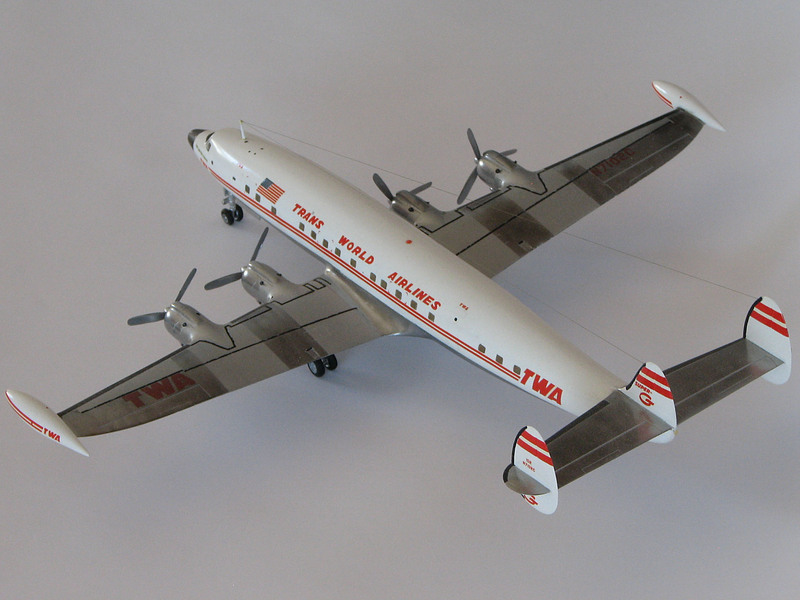 The Revell kit from the same era was no better, working out to 1/133. By today's standards, it should have been a standard 1/100 or 1/144. I decided I wanted to give it as good a finish as I knew how. In order to free myself from overwhelming anxiety, I then decided that I would build it to the "out-of-the-box" category. "Out-of-the-box" today means no detailing may be added. The modeler must use the parts and decals that come in the kit. He may correct the contours and shape of the parts and fill seams, of course. But he may not add any fancy details as is so common in a typical contest. What this means is, really, this is a true test of basic skills. But back in 1959, out-of-the-box meant something completely different. 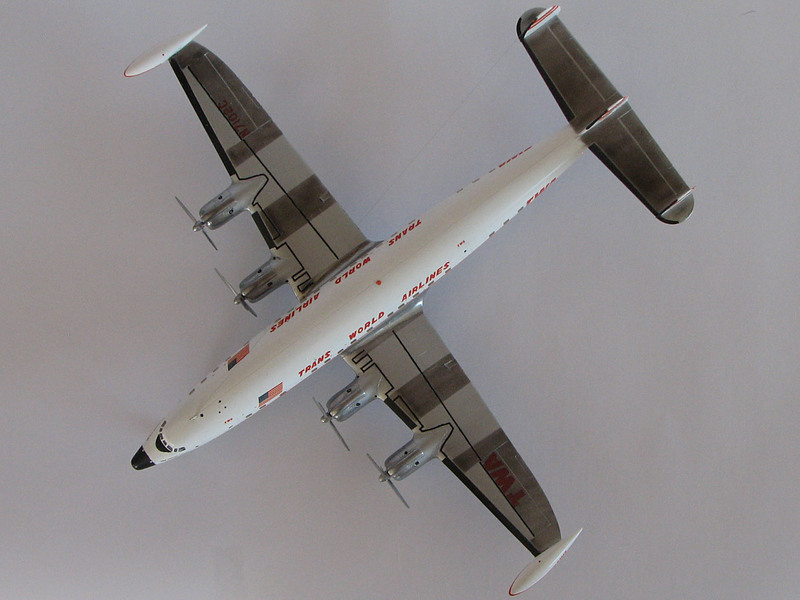 Here is an example of a well-done, out-of-the-box model from the 60's of the same model kit. And here is a side-by-side comparison of "out-of-the-box" (1988 on left, early 1960's on right). To give it the completely smooth surface I wanted, I first needed to make the windows flush and seamless. To do that, I first took the clear window parts, which were meant to be glued from the inside onto the fuselage with the window ports protruding thru the molded openings, and scraped down the surfaces that would be glued to the fuselage. Why? Because I wanted the windows to actually stick out just a bit above the surface of the fuselage. Why? Because I would later sand them down to be level to the surface (matching the fuselage curvature, of course) and polish them back to optical clarity. There will be no interior in this model--just daylight shining thru the interior. Next came time to glue the fuselage, wings, and tail parts together. For glue, I used liquid styrene cement. I apply it repeatedly to both surfaces to be joined until both surfaces become soft and sticky. Then when I mate them together, a bead of soft melted plastic squeezes up between them. When that dries, I then sand down the bead to the surface contour and, violá there is no seam! Now, to remove the indented seam around the windows, before I began sanding them down, I run a thin amount of superglue around each window. I do this repeatedly until it was built up out of the seam. Then I sand the windows down to the fuselage surface contour. After all the seams are sanded down to a smooth surface, I then polish the plastic until I have a mirror-smooth surface that looks as smooth as I want the painted model to be. I do this because the paint will not hide any imperfections. Instead, it will make them stand out!. I ran into a problem on the top fuselage seam at this point. The plastic was a little thin and the seam cracked. I had to build it up with plastic sprue and superglue and sand it down a couple of times before I succeeded. Even then, it was fragile. Now it is ready for paint. Good paint is meant to give the model its colors. But good primer gives the paint its surface to adhere to. It will also fill minor surface imperfections such as microscratches. But first one must mask the windows. That is done using white artists tape (a product that is no longer as good today as it was in '88). The tape is laid down and a thin piece of sheet metal cut and filed to the shape of a window is place over the window. The tape is cut to shape by trimming around the metal mask with a fresh, sharp xacto blade (veeeeery patiently). The cockpit windows are trimmed using the xactor blade and a small straight edge after drawing the cut lines onto the tape. Then down goes the primer. In this case, it is a white primer. I do not want to have to lay down layer after layer of white paint to get enough pigment to cover up a gray primer. The thinner the coat of final color, the better! I then carefully sand down the primer using a worn piece of 600 grit wet sanding paper. I repeat the process, only using an 800 grit and then a 1000 grit. The final coat of primer is sanded (polished, actually) using a 1600 grit (I think) of sanding paper. When done, the primer looks almost as smooth as a gloss coat. Now it is time for the first color... white all over the fuselage and tail. I use Tamiya'a acrylic flat white--acrylic because I try to avoid petrochemical fumes as best I can; and flat white because gloss white is simply flat white with gloss finish added to the mixure. What that means is that each coat of gloss white is thicker than each coat of flat white. What's more, to build up an opaque coat of white means multiple coats of paint, which results in a greater thickness. Greater thickness has two problems: first it hides fine surface detail such as inscribed lines; second for white paint it means more chance for yellowing with age and cracking or crazing over time as it dries out. After the flat white dries (maybe 1-3 days to be sure), I remove the windows masks (sometimes using an xacto blade to score around the edge of the tape) in preparation for a thin coat of clear gloss (Tamiya acrylic). I luck out. One has to mix it with solvent (an alcohol-based solvent from Tamiya, or 95% or higher denatured alcohol if one can find it) so that it has a skim milk-like viscosity. You do not want it too watery thin or too syrupy thick. You know you have it when you spray it on and it not only stays put without pooling and running down the fuselage, but also just spreads out so that the orange peel raw spray texture becomes glassy smooth before your eyes. That way you have the thinnest possible coat (you want to put down only one coat of clear gloss), which avoids both yellowing and crazing. I nailed it, but I am not good enough to do that every time. If I have to lay down a second coat, I will likely face agonizing hours of polishing, and even repainting if I polish past the gloss coat. 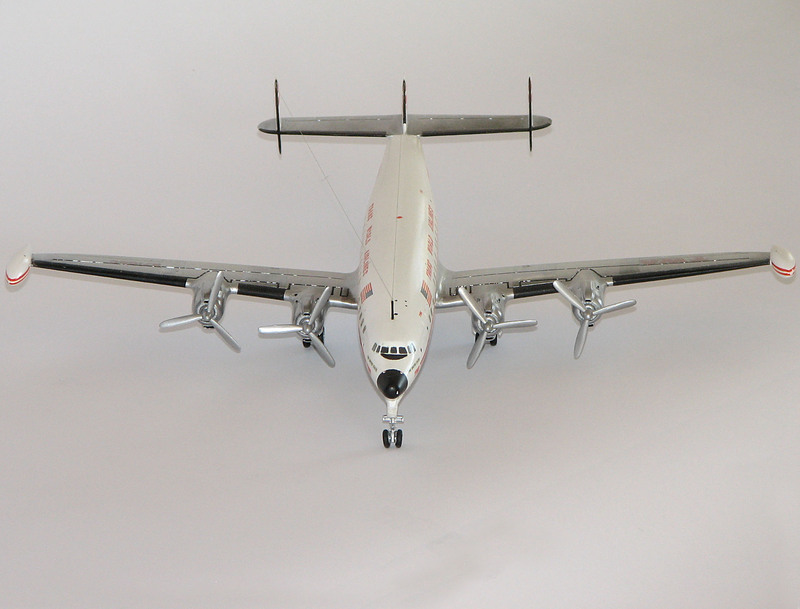 When that is dry, say, in 5-7 days, so that it is hard to the touch using a fingernail test, then it is ready for masking in order to paint the bare metal lower fuselage, tail, and wings. The best technique to imitate bare aluminum is to use... aluminium -- foil. But the problem is to make it bend around compound curved shapes of which aircraft have aplenty. The problem is aggrevated by the small scale so that the bends are even tighter. I opt for the second best solution--the SNJ system. One sprays on a base coat of aluminum particle paint and then buffs it with microground aluminum powder until it has the degree of reflectance desired, which can be varied from dull to almost mirror-like reflectivity. I polish the painted coat with the supplied SNJ buffing cloth before using the powder, just to make sure everything is smooth. Any surface scratches that were missed by all the previous polishing will show up under the SNJ! And I mean even the finest surface scratches. I wear a white glove as used by photo labs to handle negatives when I handle the model. Care must be taken to keep the aluminum powder off the white surfaces. It is easy to overbuff and end up with a near chrome-like model that looks very unnatural. So a lot of stopping and checking is done along the way. When satisfied, I CAREFULLY peel off the masking. Decals come next. I must use those in the original kit, and no others. Using an xacto knife, I trim them as near to the printed markings as possible before soaking them off the paper backing. They are fragile so again care and patience is needed. Once they are in position and the excess water is dabbed away, I paint a thin coat of Solvaset over them to make them adhere better and wrap around compound surfaces. I cannot keep dabbing at them because Solvaset actually slowly melts the decal film, which will ruin the decal. Then I paint the last markings by hand (note the markings at the emergency exits, at the base of the radome, the black strip on the wings, the de-icer boots on the wings and tail.) Sometimes I needed to carefully scrape a marking to the line thickness I wanted. Use flat paint to pull that off. Almost done. I attach the landing gear and doors using supper glue, make up some tinted epoxy to add the formation lights, and finally... add the radio antenna wires. These are made from clear plastic sprue from the kit windows tree. One heats a piece slowly and evenly. When it begins to droop, hold it higher above the flame (works best using a small candle) and slowly pull it until the filament is the thickness desired. One carefully uses super glue or a small dab of epoxy to glue the stretched sprue onto its attachment points. Let it droop slightly rather than make it taut. To remove the slack, heat a flat knife blade over a stove burner or a candle and carefully move it back and forth below the sprue. It will begin to melt and then snap taut. But if the knife is too close, the filament will melt and you must start over. It is not hard. Just practice some first. Then paint it silver or leave it clear. Silver or gray plastic will work as well visually. The same technique can be used to make thicker pieces to glue into seams. Oh yes, I also added exhaust stacks to the engine cowlings... and the propeller blades had to be thinner in width. 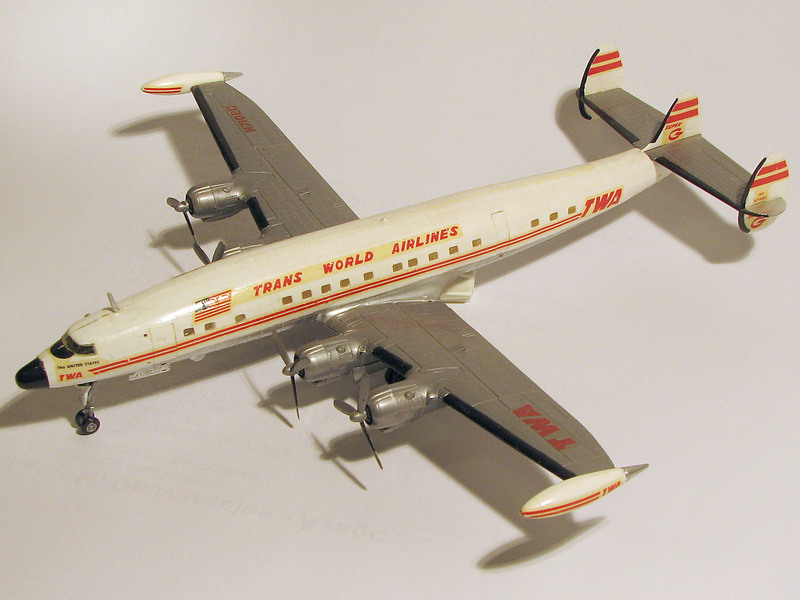 This model won its category in two contests in 1988 and 1989.